It was bound to happen considering the global economic outlook but the 2010 Singapore Air Show must be recorded as one of the quietest on record. There were few deals and no major sales by aerospace giants Airbus and Boeing. "This is a quiet airshow. The world is getting too many airshows," Airbus sales chief John Leahy said this week. "I think we need to get together as an industry and maybe limit the number of airshows," he said. Singapore immediately followed the low key, but successful Bahrain Show (which was more of a gathering than a true air show), a muted Dubai towards the end of last year, with an Indian show about to follow. Farnborough (due at the end of July) says that bookings are up to expectations. 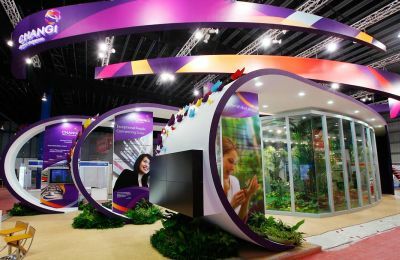 The Singapore Airshow reported that US$9bn worth of deals were signed during five days of trade, US$4bn short of the previous airshow in the city-state in 2008. The largest commercial contract announced was a US$3.5bn deal between International Aero Engines and Jetstar Airways, of which US$1.5bn was for V2500 engines and US$2bn for a long-term service agreement. The International Aero Engines consortium groups Pratt & Whitney together with Rolls-Royce, MTU Aero Engines of Germany and a trio of Japanese heavy engineering companies. Airbus signed a memorandum of understanding to sell six Airbus A330-200 aircraft to Hong Kong Airlines, valued at US$1.15bn at list price. Organisers, however, put a brave face on the slow sales. "The commercial guys are doing good business. I was thinking that the defence side would do well, but the commercial boys are snapping up the business," Jimmy Lau, Managing Director for Singapore Airshow 2010, told reporters. "The swing in the market is back and everybody is getting ready to fleet up again. Airline operators are looking to put back in service what they cut back the past year and a half or so. The growth in MRO is going to be there," Lau said. About 70% of the deals struck during the airshow came from the commercial side and the rest from the defence side, Lau said. Home carrier Singapore Airlines was bullish regarding the A380 and says it is lifting passenger loads up by 8%. On reliability the A380 had a 97% technical dispatch record in the first year, which compares favourably with the 777 at around 98% and is well ahead of the 747-400, which swung between 89% and 93% when it entered commercial operations. Airbus is targeting 98% reliability for the A380 this year. The four-day trade show was jolted by the scrapping of a flight display on the Thursday when a South Korean pilot steered his fighter jet too close to spectators, having "infringed the safety boundaries," witnesses and the show organiser said. But even what was on offer by way of display flights was limited. One wag complained that you could never get it right.